The complete history of China and the Bordeaux wine market, plus the truth about Chinese investors buying vineyards in Bordeaux and the current state of affairs between Bordeaux and China. China, like much of the world, especially in new and emerging markets for Bordeaux wine always started by focusing on buying wines according to the historic 1855 Classification of the Medoc. Why not? While the original intention of the Classification was not intended to give classified status to the 61 chateaux over all the other estates in Bordeaux forever, at close to 120 years of age, that is exactly what happened. Today, the classification continues informing consumers in new markets when they first buying Bordeaux wine about the levels of quality in wine. While there are of course estates inside the classification that perform better than other properties at the high levels of classification, there are also wineries that under perform as well. Still, it is an easy and efficient way to quickly conclude who makes the best wine in Bordeaux today. Think about it. No other major wine region placed their top estates in 5, simple, easy to understand categories with those results being officially certified by the French Government. All anyone had to understand was that on a scale from 1-5, First Growth was better than a Second Growth, Second Growths topped Third Growths, Third Growths were superior to Fourth Growths and of course, Fourth Growths were above a Fifth Growth. Plus a 5th Growth was still a very good wine and better than the thousands of other unclassified Bordeaux wines. Because of the Classification, it was quite easy for the Chinese market to focus their buying on established Left Bank Bordeaux estates. All they had to know was how to count from 1 to 5! 1982 is a major turning point in Bordeaux for many reasons. Yes, the year was the first great vintage of the modern era, signaling a new generation was about to take over Bordeaux. 1982 also launched the career of Robert M. Parker, the most important wine writer of all time. Michel Rolland also started his consultancy that year as well. In China, Bordeaux was barely a thought. Ex Pats from England and France living in Hong Kong knew about Bordeaux. But in 1982, less than $10,000 of Bordeaux wine was being sold to China. 1982 was also the year that Topsy Trading Company was founded by Thomas Yip. The initial hope was that Thomas Yip and Topsy Trading Company would supply all the top hotels with wine. In those days, 5 star luxury hotels were still far and few between. Topsy Trading got off to slow start, but they were connected with all the right people. Their first Bordeaux purchase was the legendary Pomerol, Petrus! Petrus remains the world’s most collectible Right Bank Bordeaux wine and that fact has not been lost on the Chinese marketplace. 10 years after their first purchase of Petrus, Topsy Trading was made an offer that was too difficult to pass on, several hundred cases of 1982 Chateau Lafite Rothschild at a close out price! That initial purchase was the start to Lafite Rothschild becoming the most expensive, sought after brand in the Chinese and Asian markets. Not only was the wine famous, it was also a First Growth chateaux. So drinking a bottle of 1982 Lafite Rothschild meant you were enjoying the best wine made, and if you in turn gave a bottle as a gift, hoping to curry favor, you were offering the best wine in the world to the burgeoning Chinese market in those days. In a decade, Topsy Trading managed to acquire millions of dollars, worth of Chateau Lafite Rothschild, cornering the market in China. Lafite quickly became known as the official gift within the Communist Party. Carraudes de Lafite was also in play, simply because it shared names with Lafite Rothschild, and it was a lot less money to gift or drink. The next step in the chain belongs to Jean Michel Cazes, the owner of Chateau Lynch Bages, the famous Fifth Growth estate. Jean Michel Cazes sold over 20,000 cases of Lynch Bages to Cathay Pacific Airlines for their First Class customers. 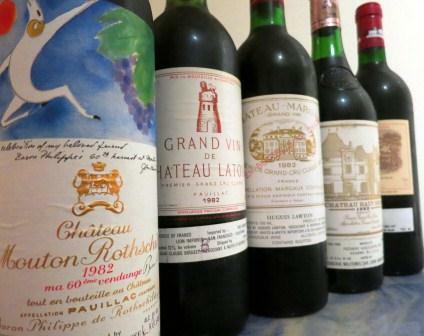 Now, more people from the Chinese market were seeing Bordeaux wine as a true first class, luxury item. Montrose Wine and Food Company opened offices in Beijing in 1988 for the purposes of importing wine. They were well ahead of the curve. With little demand for Bordeaux in China, it was easy for the Montrose Wine and Food Company to secure allocations of the all the best wines. Bordeaux survives and prospers by continually opening new markets. Japan had been buying Bordeaux for decades. Everyone in Bordeaux was hoping that China, with over 1 billion people would eventually follow suit. Bordeaux, being experienced in playing the long game was patient. The negociants knew it would only be a matter of time. Many of the freshly minted wealthy class in China were already buying new, expensive, high-end watches to help keep track of the time. Don St. Pierre formed ASC, Asia Solutions Corporation in 1996. ASC quickly launched their new company.l But ASC and Don St. Pierre did not have many contacts yet in Bordeaux. Providence stepped in. Jean Guillaume Prats of Cos d’Estournel was also in China at the time, seeking importers for the wines his family produced from their St. Estephe estate. The two men became fast friends, the introductions needed were made and ASC was now in business. At this point, they were able to buy the wine, the difficulty was finding customers that were not fellow expats. The next major, non-Asian player to enter the Chinese market was the newly founded company, Bordeaux Index, which remains one of the world’s largest buyers and sellers of Bordeaux wine today. Located in London, they were seeking new customers. Bordeaux wine was clearly getting better and prices were escalating keeping up with the levels of increased quality and demand. Older customers were feeling priced out of some of their favorite brands. Just like the negociants on the other side of the aisle that were also creating new markets, so was Bordeaux Index. Opening offices in China was natural for Bordeaux Index as they were already selling a sizable amount of wine to Asia. By 2008, Bordeaux Index, now known as BI Wines opened their first Asian office in Hong Kong. Fortuitously for BI Wines, 2008 became a watershed year for the growth of the fine wine market in China. Taxes on wine imported to Hong Kong were reduced from 40% to zero! As you can imagine, with all wines now selling for a massive 40% discount, the now, sizzling, hot, Chinese wine market was off to the races. The amazing drop in taxes was accomplished by the extremely wealthy, Government official and famous wine collector, Henry Tang. Henry Tang single-handedly managed to spearhead the movement to drop the taxes on imported wine to Hong Kong. The same day taxes were abolished, sales for Bordeaux wine skyrocketed in China. Ironically, that also sparked the largest increase in wine prices the world had ever seen. For example, an in-demand wine that was slowly selling for $100 per bottle, plus the 40% tax blasted up to $300 per bottle, just to keep up with the new demand. But people did not know, or they did not care that prices higher. They were just happy not to be paying taxes to the Chinese government. It was off to the races for the Chinese wine market and Bordeaux couldn’t get over there fast enough. The other result of the drop in taxes elevated Hong Kong to the center of the wine buying world in the auction market and for the entire Asian market when it came to retail wine sales. In what seemed like the blink of an eye, Hong Kong quickly became the center of the wine universe, when it came to auction sales. More wine was bought and sold in China, than in any other market in the world. The volume of wine and money changing hands was staggering! The prefect storm had all the elements to create massive growth and escalating prices in the Chinese market. The American stock market was tumbling, and so were other western exchanges. Land prices were dropping. But the Chinese economy was on fire! Due to the economic crisis, the prices for the good, but not great 2008 vintage was purposely priced at low levels to spark demand, when sales were expected to be slow. Bordeaux was seen as one of the great luxury items, and with money to burn, China was ready to take their seat at the table. Imports exploded in volume and value. In less than 1 year, the amount sold to Hong Kong jumped between 150% to 200%! By early 2010, the amount of Bordeaux being sold to Hong Kong and Macau was unfathomable! They were clearly the largest purchases of Bordeaux in the world at this point in time. The fallout from this expansion changed how wines were being allocated to satisfy the new demand. Previous markets that relied on certain numbers of cases were not able to buy the same amount of wine, and prices for the 2009 vintage, which we consider an extraordinary vintage made it the highest priced vintage in history! As you can see, all of that initial growth turned out to be a mixed blessing. Yes, more wine was now readily available, but at much higher prices from the negociants. Hoping to buy wine at lower price levels, some industrious Chinese buyers tried to avoid buying wine through the negociant system. They could not understand why they were not able to purchase wine through direct negations with the chateau owners. The Chinese business people did not like, enjoy or understand why these middlemen had to be part of every deal. Allocations were also an issue. The thought process in China was, we have the money and the ability to buy and sell entire productions, why couldn’t they just purchase what they wanted? The lack of understanding for the Bordeaux negociant system went even further. There were buyers that wanted to purchase an entire harvest, giving them an exclusive distribution of the wine for the world. This is of course not possible for any revered brand, as their wines are sold through numerous negociants to a myriad of countries all over the world. The demand for exclusivity was relentless. As we mentioned, it is bad business for a chateau to sell all their wine to one client in a single market. However, it was a brilliant marketing decision to sell their declassified wine to a specific client, allowing them to invent a new brand. From that point forward, the buyer could control the cost and sale of the wine, and the chateaux now had an easy way to sell their excess wine. It was a marriage made in heaven and the birth of a new market. Buying low and selling high is nothing new. The Chinese were experts at it. Industrious entrepreneurs looked to buy bulk wine. Bulk wine is considered not good enough to sell by the chateau with their name on the bottle. 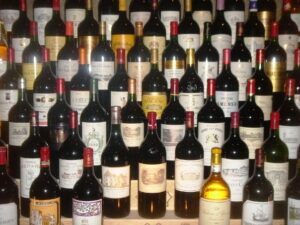 The bulk wine is sold most often to negociants who bottle the wine under their own label, according to the rules in Bordeaux. So if all the grapes were from a specific appellation, for example, Pauillac, the wines would be sold under a brand name as coming from Pauillac. If the wine was the product of various appellations, the wine would be sold as a generic AOC Bordeaux. For these new Chinese marketers, this was a gold mine! They could be the wine that would normally sell for 2 Euros, repackage and label it under their own name and sell it for up to 10 times more money! Taking this a step further, this explains why so many, extremely wealthy Chinese business people purchase vineyards with beautiful chateaux, but poor terroirs. Several of these new buyers were obtaining land in Entre Deux Mers. The low cost of vineyard land allowed the buyers to reap a windfall by repacking their wine on an exclusive basis and sell it in China! The value to Chinese investors was the rights to state their wine was from Bordeaux, their ability to create a unique brand, and be able to own all the stock and control all the marketing, packaging pricing and distribution. This formula will not create great wine, but it is the perfect product for successful, savvy, Chinese marketeers seeking profit. This formula explains the reticence to buy a top Classified Growth, even if one were to come up for sale. The profit margin would be far too slim, if not risky for most Chinese investors. The first two Asian entrepreneurs to purchase quality vineyard land were Peter Kowk, with Haut Brisson and Tour Saint Christophe in St. Emilion, along with Enclos Tourmaline in Pomerol, and Pan Sutong, who bought Le Bon Pasteur from Michel Rolland as well as Sloan Vineyards in the Napa Valley. As of 2016, only one other classified, Saint Emilion wine has been sold to a Chinese investor, Chateau Bellefont Belcier. While it’s not a classified growth, the size and value of the deal merits notice. Chinese born Lam Kok purchased Chateau La Riviere in Fronsac, and used the massive chateau to create a unique, luxury, wine country experience hotel. As you can see, all these vineyard acquisitions by Chinese investors are for properties in the Right Bank, or other lesser terroirs. By 2010, many chateau owners and negociants thought China was the second coming. With untold amounts of wealth, and the potential for more than 100 million new customers, Bordeaux could not maintain their cool. Prices shot up to meet what they considered to be the new level of demand. They completely avoided contact with reality. One of the biggest issues for Bordeaux and China is that most of the top wines of Bordeaux are sold as futures, meaning the wines are paid for up to 24 months in advance of delivery. This concept was not acceptable to Chinese buyers. Chinese merchants were only gamblers to a certain extent. They demanded profits. Who doesn’t? But with many Chinese buyers, if they agree to buy a wine and the price drops, they see no problem backing out of the deal. They will purchase something else tomorrow. That is completely unacceptable with most western merchants, especially the Bordelais with hundreds of years of experience doing business with a handshake. That basic misreading of the culture gap proved to be disastrous for several people on both sides of the aisle. The Chinese market was hot in 2009. Everyone wanted to get in, while the getting was good. The uninformed Chinese customers were buying all the best names in Bordeaux, from all the weakest vintages. The quantity of wine being shipped to Bordeaux changed how the entire world market for Bordeaux wine was allocated. The top chateaux cannot make more wine. Their production is finite. So, with the demand from China for a continuing increase in their supply for the best wines, those wines had to come from someplace. That meant that every country was now going to get less wine, and prices were set to rise. Thousands of cases of First Growths and other top brands from off and poor years were finally leaving the warehouses of Bordeaux. The continuous news about the upcoming 2009 harvest tossed fuel onto the fire. Everyone wanted in on what was already said to be the vintage of the century, and this was before a single grape was picked! 2009 Bordeaux did meet and even beat many taster’s and critics expectations for quality. Robert Parker scored a record breaking 29 wines 100 Pts! The high-quality, in-demand wines were clearly priced to match, making 2009 Bordeaux the most expensive Bordeaux vintage of all time! Released on the heels of the recession, the wines sold, but most had difficulty moving up in price. Back to back successful vintages in Bordeaux do not happen often. There are 4 examples over the past 120 years. 1899, 1900, 1928, 1929, 1989, 1990 and 2009, 2010 are the only examples I can think of. Different in style, but equally mind blowing in quality, 2010 was priced even higher than 2009! After the 2010 vintage was first offered in 2011 as futures, the demand and eventual oversupply, coupled with a declining world market led to a disaster for many people on both sides of the aisle, in Bordeaux and in China! You have to remember, that much of what drove the initial purchase of Bordeaux wine in China was the combination of the desire to own what was universally considered the best wines in the world, coupled with the allure of quick profits. While the quality of the wine was there, along with the prestige and cachet, it was now evident that the previously quick and easy profits were no longer quick or easy. The loss of profits was not just for wines purchased as futures. The 2008 vintage of Lafite Rothschild was initially offered at $200 per bottle. Due in part to placing the symbol for the number 8 in Chinese on the bottle, (8 is considered a lucky number in China,) prices exploded to $1,600 per bottle. Today, 2008 Lafite can purchased for about $650 per bottle. A big jump from $200, but a longer fall from its $1,600 peak. Chateau Mouton Rothschild also pandered to the Chinese market with their 2008 wine by using artwork from the famous Chinese artist Xu Lei for the wines label. Prices for 2008 Chateau Mouton Rothschild rocketed to over $1,200 per bottle. Today, that same wine can be obtained for $450 per bottle. With vintages from 2 First Growths losing money for Chinese speculators, this was viewed as a harbinger of things to come for Chinese wine buyers causing buyers and sellers to closely examine the Future of buying Bordeaux futures in China. By 2012, many of the largest buyers in China lost interest in Bordeaux. Their attention moved to Burgundy. The assumption was that due to the smaller amounts of wine being produced in Burgundy, there was more prestige and potential for trading profits. Buying wines from other regions was not an issue. The issue was the tens of millions of dollars in orders for Bordeaux wine that were being cancelled by numerous Chinese buyers. This instantly put further pressure on the marketplace, because those previously, considered sold, stocks were now returning to the market, which was already overflowing with unsold wine. It was not only the retail market for wines in China that was in decline, the once booming Hong Kong auction market was also falling fast. By 2012, less than 5 years after China was the world’s most important auction market, sales in the Chinese auction market were cut in half. While Hong Kong remains an important market for wine auctions, it is no longer the leading venue. 2012 saw the first sale of a major negociant to a Chinese firm, DIVA was bought by Bright Foods, through their subsidiary, Shanghai, Sugar, Cigarette and Wine Company. This was a smart buy as it allowed access to all the top Bordeaux wines at a discount price. That gave them an instant 20% margin already built into the price. The famous Chinese billionaire investor and founder of Alibaba, Jack Ma, recently purchased several small vineyards in Bordeaux, including Chateau Perenne in the Cotes de Blaye appellation from Bernard Magrez. Jack Ma also started a negociant company for other Chinese investors, Cellar Privilege. Zhao Wei, the popular, Chinese film star purchased Chateau Monlot, a small estate in Saint Emilion. Other wealthy Chinese investors have started buying land in Bordeaux. 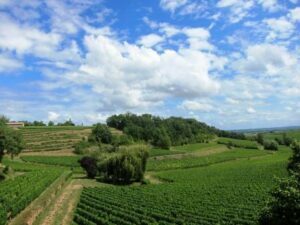 Even with more than 150 Chinese owned, Bordeaux vineyards, because they do not own any Left Bank Classified Growth estates, their presence remains discreet. Two more changes took place in 2012 further eroding the demand for high priced, Bordeaux wine in China and in other parts of Asia. Robert Parker was about to retire. Only a few people in his inner circle knew that Robert Parker had grown tired of rating wine. Even now, after more than a year following his retirement from Bordeaux, his power remains unequaled for any critic in any field. It might be difficult to fathom, but the entire pricing structure of Bordeaux and the futures market rested completely on the shoulders of Robert Parker. Without new scores and tasting notes from Parker, wines were going to be much harder to sell, especially en primeur. Other issues with the Chinese market continue to plague the relationship with Bordeaux. Copyright infringement remains rampant. Anyone in China that is only mildly aware of the increasing popularity of Bordeaux wine can file for copyrights to protect names and logos. China is often referred to as the wild-west for some of its policies, starting with their copyright department. That is because this allows for the first to file to claim ownership the copyright, regardless of who actually owns the brand. An even thornier issue is rampant counterfeiting and forgeries of famous wines. 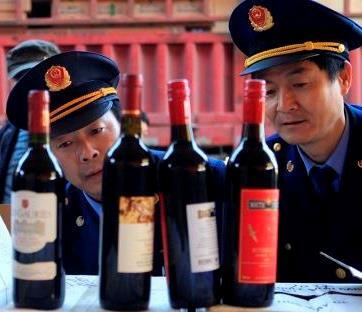 Millions of fake, expensive wine bottles were being sold left and right all over China. In fact, they still are, even if the amount of forged bottles has slightly declined. This remains a huge issue. Unsuspecting buyers with no idea of what the real label looks like or how the wine should taste, have purchased fraudulent wines. There have been Crackdowns and arrests in China for counterfeit wine but more needs to be done to clean up the system in China to protect consumers and the wine industry. However, the bigger issue in China was the new Chinese Premier, Wen Jiabao who announced an end to public displays of wealth and made it a crime to use Government funds to pay for pricey gifts like expensive bottles of Bordeaux wine. It was now unpopular to open expensive bottles of wine in restaurants as well. Shows of wealth were forced to go underground, in private homes. Austerity had set in. Discretion became the new, name of the game. This new attitude further reduced demand for Bordeaux wine and prices continued sliding. However, it is clearly not all gloom and doom for Bordeaux and China. Several Bordeaux chateau are firmly branded in China. The wines from the Classified Growths from Medoc remain strong sellers. Aside from the First Growths and Petrus, there are other brands that continue selling at levels above their growth status or their peers: Beychevelle, (for their Dragon Boat label,) Grand Puy Lacoste, for their Lacoste name in their logo, earning them the nickname of the alligator wine, Chateau Angelus is referred to as “kin chung” in China, which means golden bell, the image that their famous logo used for the winery on their label. Lynch Bages and Valandraud are both popular due to their non-stop promotion and targeting the region. All those chateaux continue maintaining a strong presence in China and Asia. There are of course other Bordeaux producers as well negociants that realize they need to keep an important brand presence in China. On the other side of the fence, the Chinese wine industry is continually expanding. While a few wineries existed in China during the 1950’s, production was almost non-existent. The first winery in China created with an investment from a foreign company started out in 1980, when Remy Martin agreed to a partnership with the Chinese government. Pernod Ricard was the next French company to make an investment in a Chinese vineyard. By the early 1990’s, vineyards were starting to be actively cultivated, with a few hundred wineries struggling to make a profit. As of 2016, there are more hectares planted with grape vines in China than in any other country except for Spain and France! Some of these new vineyards are massive. Chateau Lion is 600 hectares of vines! While much of the wine is easy, drinking, lower priced bottles, there is a growing class of luxury Chinese wines as well. Ao Yun, the first true, luxury, Chinese branded wine was released in 2015. The winery and vineyard is owned by LVMH in a partnership with the Chinese company VATS, who is best known for producing the Chinese alcoholic beverage, Baijiu, uses fruit from vines planted in the Shangri-La region in the Yunnan province, not far from Tibet. The vines are planted on both sides of the Mekong River on very steep, rocky, gravel, hillside elevations that range from 7,200 to 8,500 feet. These elevations are common in the region, as they are not that far from the Himalayan mountains! The 30 hectare vineyard can be divided into 320 separate parcels. The harvest takes an average of 3 weeks to complete, which normally takes place from the middle of October to early November. The climate during the growing season runs from cool to cold, and dry. But what makes it all work in this harsh environment is the long periods of sunshine that allow for extended periods of photosynthesis. The cold nights, which can be as much as 30 degrees Celsius cooler than the day time highs also factor into the equation, adding a lot of freshness to the wine. At this point in time, everything at Ao Yun is still quite primitive. With no tractors, horses, or mules, the vines are plowed with the help of yaks, which work quite well, so I am told. Electric power can also be an issue, so instead of using destemmers, the sorters needed to destem the grapes by hand, for at least the debut vintage. Due to the unique climatic conditions, the growing season here is quite long, with a hang time of 160 days! That is much longer than in most other wine regions I know of, which average 110-120 days. The number of days is measured from flowering to picking. All the farming is done using only organic methods. 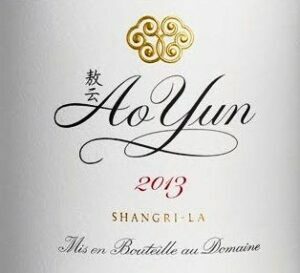 Ao Yun is made from a blend of 90% Cabernet Sauvignon and 10% Cabernet Franc. The wine is aged in 50% new, French oak barrels for 12 to 16 months. Yields are low by design and the terroir. The project, which stared in 2009 is headed by Jean-Guillaume Prats. The name, Ao Yun was inspired by its elevated geography, high in the mountains. When translated, Ao Yun means flying over the clouds. The wine sells for $250 per bottle! However, the wine is not easy to find as the production, at least at this point is less than 2,000 cases per vintage for the world! However, production is set to increase to 3,000 cases by the 2014 vintage. The Ao Yun vineyards were previously planted to vines as far back as the 1800’s for use by Jesuit Missionaries. The owners of Chateau Lafite Rothschild, DBR entered into a partnership with the CITC, China International Trust and Investment Corporation, a Chinese Government sponsored company in 2008. Because the land was previously used to farm peanuts, it took 3 years before they could begin cultivating the land for grape vines. Located in the Penglai Peninsula in the Shandong Province in China, they were ready to start planting vines by 2011. At the time, 25 hectares of vines are planted to Cabernet Sauvignon and Syrah. The project was headed by Eric Kohler, who has since been promoted and is now the Technical Director of Chateau Lafite Rothschild. In China, the vineyards are not owned by the producers, they are on 50 year leases. Regardless of all the potential difficulties, one thing you can take to the bank is, you can expect more investments from Bordeaux in Chinese vineyards over the next several years. Where is China and Bordeaux today? 2015 and 2016 Bordeaux are both very strong vintages, the best in more than 5 years. It is too soon to tell if those vintages are strong enough to win back the attention of the Chinese market. One of the major differences is the lack of importance for the En Primeur campaign. Of course it is still the goal for the chateau and negociants to sell as much wine as possible as futures. But when it comes to Bordeaux and China, you need to remember a few key points. Many of the top chateaux are holding back larger percentages of stocks, hoping they can offer the wines at higher prices to the market, when the wines are actually in bottle and ready for delivery. So less wine is available for trading and selling between China and Bordeaux. More importantly, the Chinese market is basically averse to buying wines en primeur. China is a cash and carry market. Most of the transactions for new Bordeaux vintages will take place when the wines are in the bottle. Without Robert Parker providing his sage advice, and the general malaise over buying futures from the older, established markets, futures in general are going to play a continuing role in the sales of Bordeaux. But make no mistake, Bordeaux makes the world’s greatest, most collectible, age-worthy wine, so sooner or later, my bet is, things are going to sort themselves out. In fact, by 2017, due in part to the nonstop promotion from Bordeaux by the chateaux, negociants and trade board, and a strong presence on Alibaba, China once again retained the top spot for the number of bottles imported from Bordeaux. To give you a good idea on the volume today, close to 80 million bottles are currently being exported to Mainland China and Hong Kong. Those numbers are truly staggering. They include all levels of Bordeaux wine from simple AOC bottling’s, Cru Bourgeois wines and of course Classified Growths. By the close of 2016, it was reported by the CIVB, the trade and promotional organization of Bordeaux that while Hong Kong was purchasing 11% less wine by volume, the actual value of the wine increased by almost 25%. Today, the trend for wine buyers in Hong Kong is t spend more money per bottle on Bordeaux wine. In China, the situation seems to be growing once again in both cost per bottle and the number of bottles being imported. As a country, in 2016, China spent more than 300 Million Euros importing Bordeaux wine. The learning curve for Chinese wine lovers has been rapid. Consumers are no longer focused solely on only the most expensive brand names. China is now also quite vintage conscious, similar to the American market. Wine buyers in China are seeking quality and value, which is the right blend needed for long term appreciation of fine wine. It remains to be seen what happens between Bordeaux and China. With over 1 billion potential customers, as I said previously, you can bet things are going to work out sooner or later. There is just too much at stake, on both sides of the fence for any other conclusion.